Have you ever thought of living in a gated community? Many people connect them to rich people, and in some way, they can be pricey. On the other hand, if you have an intention to purchase a home in a gated community, you will experience many benefits. Secluded location, peace, and friendly neighborhood are only some of the advantages of gated community. You will feel protected and secure here. We are going to present you five reasons, why you should choose gated community instead of some residential neighborhood. Due to limited access, people who live in gated communities experience less traffic than residing in a city. No nervous driver, honking, traffic jams and limited parking space. Your children will feel safe, without worrying about passing cars. Buses, cars, and cabs don’t have access inside, which means you will have less noise and chaos. Considering we all live in a busy world, peace and quiet surrounding are what we need the most. Gated communities are famous for their secluded location; they are usually located away from the city. You will be able to enjoy the calmer atmosphere because you are in some way hidden. The proximity to nearby stores and businesses, you won’t have a need to use a car, you finish everything by foot. The piece is one of the priceless things in this world, and when you get back home, from a tired day at work, you will soon learn to value how much calm surroundings can have a positive effect on you. Typically, gated community has modern infrastructure and houses that have an appealing look. In addition to this, everything is well kept and maintained; you will have beautiful parks, new roads, and stylish homes. Your surroundings will look clean and attractive. Residents will have garbage-free streets. Gated communities also include bridges and lakes in the middle of the neighborhood, which will make it even more beautiful. At the end of the busy day, you will have something to looking forward, besides your family. In most cases, gated communities feature locked gates and security guards, and only residents may enter the neighborhood. These features give you a sense of security, knowing that no one can enter without your approval. The locked gate and safety guard prevent a stranger from wondering around and targeting the houses. Cameras are also one of the useful features that many gated communities have. Everything is monitored, and security guards will patrol 24/7. Burglaries are also reduced because of lack of access. 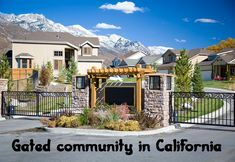 Gated communities behave like small towns, where people are close and meet one another on a daily basis. Many gated communities are engaged in mutual projects, create family events and picnics where they can spend some time together. They all have community space which they share and maintain together. People behave like one large family, and they help each other, which is a rarity today. When you think about gated community, what are the first things that come to your mind? You must think about safety, exclusivity, celebrities living there, expensive homes and so on. But, what hide those gates and will your family fit there? 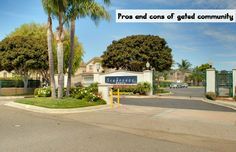 Before you choose to move to a gated community, we are going to explain some basic things to you and make this decision much easier. Among the other things, nowadays, people are often worried about the safety of their families. Privacy and security are one of the great features that gated community provides and in some cases, they don’t come as cheap ones. Many people choose gated community because of the element of safety. Security has become a major issue in modern society, especially regarding criminal activities. The crime rate is significantly reduced in gated communities. Residential homes in a gated community come as a pleasant thing, especially when you don’t have to worry about the robbery and solicitors. Of course, no one can guarantee you that you won’t be a victim of the crime, you still need to lock your doors, but at least, some gated communities have guards and gates with keypads. Traffic and speeding cars are significantly reduced in gated communities. You children will feel safe while playing outside or riding a bike. Another positive side of gated community is high quality of homes, they have a stricter building code and have unique design. If you decide to sell your house later, this can give you great advantage because you will be able to make a better deal. In most cases, won’t have to worry about boring neighbors and unkempt lawns and yards. Homeowners in a gated community are proud of their homes and they generally keep it in a good condition. Usually, a few houses are always available for sale. Considering social value, you can explore a lot of possibilities here, for example community centers, various events and activities for the family. If you have an intention to buy a house in a gated community, contact this agent. This one of the downsides of gated communities are the high prices of homes and expensive HOA fees, after all, you have to pay gate guards, private security, and maintenance. Most roads in gated communities are private, so you will need to participate in their maintenance, and good luck negotiating with your neighbors. When we talk about security, all depends on how much money you are willing to pay and what kind of system you are going to install. There is a high possibility that the community won’t be patrolled by a guard unless HOA approves such action. On the other hand, if the community only has a gate, thieves won’t have a hard time breaching it. You have to make one mistake and to give a code to a pizza delivery guy, and your security is at jeopardy. Gated community is a small city which has all the essentials you will need.